Whatever your fitness goals are or rehab need is, the Elite Ultra SL Exercise Bike provides a stable platform from the ground up, with a sturdy heavy duty frame constructed with 2mm thick tubed steel, 20% heavier than most other bikes at the same price point. The strong 3 piece crank system, with 6.5” crank arms and low step-through framework make the Elite Ultra SL Exercise Bike ideal for injury rehabilitation. With multiple seat adjustments, both vertical and horizontal, the padded seat can be positioned for a safe and comfortable ride. 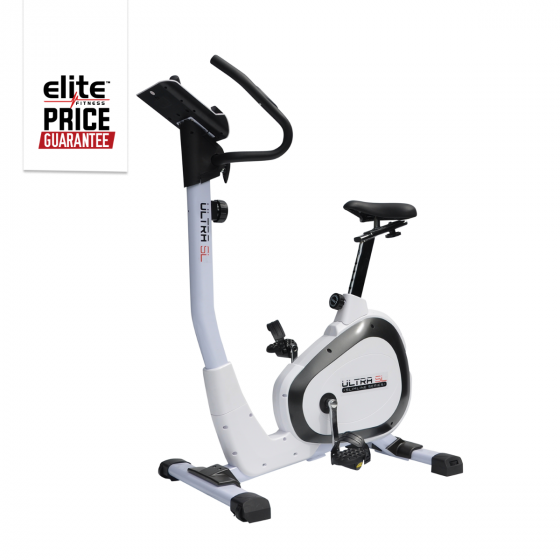 With 8 levels of magnetic resistance, easily adjusted at the turn of a dial, the Elite Ultra SL Exercise Bike provides a smooth and quiet cycling movement utilising a low maintenance belt drive mechanism and heavy precision balanced 6.5kg flywheel. The LCD single window console, provides valuable workout feedback on Time, Speed, Distance, Calories, RPM and Heart Rate, keeping you motivated and focused on achieving your workout goal. Hand pulse heart rate sensors are also located on the adjustable handlebars, which can be moved to suit your personal preference. *Note: Currently sold out, more stock arriving soon.